This tour is designed for those who are short on time but still want to experience the true essence of Thailand. The journey begins in Bangkok, a bustling city with a mixture of stunning temples, views that take your breath away and modern aspect that will rival any large city. Next, you fly to the relaxing and friendly city of Chiang Mai, located northern Thailand, which is surrounded by serene mountains and lush fields of terraced rice paddies, browses colourful night markets specializing in local handicrafts, paper umbrellas, and beautiful silk weavings. When you arrive at the international airport of Bangkok, you will be welcomed by our Travel Thailand guide and private transfer to your hotel in the center of the city. Leave Bangkok for the original floating market, which is about half way to Kanchanaburi, called Damnoen Saduak. Then, we continue to Kanchanaburi visiting the World War II cemetery; World War II museum & Bridge over the river Kwai to look at surrounding. Leave Bangkok for the original floating market, which is about half way to Kanchanaburi, called Damnoen Saduak. Then, we continue to Kanchanaburi visiting the World War II cemetery; World War II museum & Bridge over the river Kwai to look at surrounding. Continue the visit to Hell-Fine-Pass Memorial museum and walk to see the mountain cutting for build the rain way by prisoner of world war II. 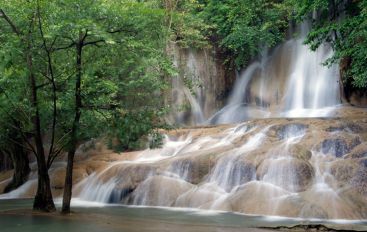 Following relax at Sai Yok Noi waterfall, and overnight in Kanchanaburi. You will start the day taking the tour in Bangkok. The first visit is The Grand Palace, which is the official Palace of The King Of Siam since 1782, made up of numerous buildings, halls, pavilions set around open lawns, gardens and courtyards. It is located on the bank of Chao Phraya River. Inside the Grand Palace complex is Wat Phra Kaeo or Temple of the Emerald Buddha – the most beautiful and sacred Buddhist temple in Thailand. Then cross Chao Phraya River by ferry to Thon Buri to visit Wat Arun which is known as Temple of Dawn – one of the best well-known sites in Bankok. It is best seen from the opposite side of the river. Today you set out on a guided tour to the most famous and interesting temples in the city – Wat Sri Supan, Wat Phra Singh and Wat Chedi Luang clustered conveniently close to each other. Today you set out on a guided tour to the most famous and interesting temples in the city – Wat Sri Supan, Wat Phra Singh and Wat Chedi Luang clustered conveniently close to each other. Continue to visit Wat Phrathad Doi Suthep – 3,500 feet above sea-level, the most sacred temple in Northern Thailand, containing a holy relic of Lord Buddha. You will have a panoramic view of the city from this height. Rest of the day, enjoy the atmosphere at one of the most famous market in Thailand – Chiang Mai Night Bazaar. Overnight at hotel in Chiang Mai. Head to the south of Chiang Mai for a visit to Doi Inthanon National Park. The visit today will be including:- The summit of Doi Inthanon mountain with the height 2,565 meters above sea level.- Natural trails for mini walking in the evergreen forest 5 minutes (if weather permits)- Twin pagodas of King and queen with a royal terraced flower garden.- Hmong Hill tribe market- Thai set lunch- White Karen hill tribe village- Wachirathan waterfall- Return to Chiang Mai by late afternoon. Today you are free until it is time for your driver to take you to the airport for your flight home, or to your next destination. Their service and recommendations were excellent. The tour guide was really nice, spoke perfect english and always gave us explanations about the history of the places we visited. For sure we will book with them again on our next trip to Chiang Mai. Bought the 7days 6 nights package with several of my friends from Australia. Amazing tour guide, deep understanding of Thai history and culture. We had a very good time touring all the way down to Chiangmai. Love the food too!! Our trip was certainly an enjoyable experience, partially due to the region, people we met along the way. But also due to the seamless transfers, accomodation and friendly guides organized by the tour operator. It seemed an affordable tour for many people. Two of my favourite things about Thailand are the food and the people. Now I have to change that to people and the food after the fantastic service. My son and I ended up having our next 7 days planned for us. This isn't to say we're pressured to join a tour - they really enjoy their job and giving us the benefit of their own travels and experience. The reason we booked with them is because they went in depth of what's included at the tour, and they were very informative as regards the schedule. Certainly they know what they are doing. Highly recommended and looking forward to go back to Chiang Mai and do more tours with them.